The Nissan Frontier is still capable mid-size pickup truck which delivers good towing and hauling capabilities and some of its versions are well-equipped for off-road adventures. However, this model has been around in the similar form since the 2005 model year when it entered in the current generation. It was refreshed in 2011 but since than it looks that Nissan has been more focused on other offerings from its assortment. It has recently offered the new Titan XD and standard Titan model but the Frontier has still been on waiting for redesign. After the return of the twins Chevy Silverado and GMC Canyon and refreshed Toyota Tacoma everyone expected that the Nissan will respond with the new Frontier for the 2017 model year but now it looks that new Frontier will likely come as 2018 Nissan Frontier. The company hasn’t confirmed the new-generation Frontier yet and it is still early to know about its specifications but some assumptions have been made. It is expected that the new model will exploit similar exterior design as the redesigned NP300 Navara and it will also offer improved powertrains. It will also be more efficient and equipped with modern tech. While the new 2018 Nissan Frontier is expected to redesigned model it won’t be large departure in terms of styling compared to the current model. It will be instantly recognizable as the Frontier but it should wear modernized exterior components and sheet metal. Up front the grill will continue with V-shaped pattern but new version should include more chrome inserts and slightly different proportions. New grille design will be flanked by the new restyled headlights which will also improve the front side look. Bellow the new bumper will feature new shape and will include new fog lights. The model will also get more sculpted hood and side panels are also expected to get more aggressive treatment with more pronounced fender flares and sharper body lines. The rear side will get new taillights and reworked bumper. The new wheel sets will also be offered to complement the new Frontier’s appearance. Inside, the model will get better materials and upgraded equipment. The dash design will be refreshed with new contrasting inserts and rearranged center stack which will include larger center screen and re-utilized controls. The modernized instrument cluster will be seen in front of the redesigned steering wheel. The driver and front passenger will enjoy in the comfortable bucket seats which will be available with heating, cooling and power functionality and driver memory setting. There will also be upgraded infotainment system with larger screen, navigation, smartphone compatibility, good sound system, voice commands and so on. The model should also offer improved safety which will comprise more advanced options such as surround-view camera system, blind spot monitoring, lane departure warning, etc. The model is expected to be offered in two body styles including extended cab and crew cab models. When it comes to powertains, the new 2018 Nissan Frontier will be focused to deliver improved fuel economy as much it should be dedicated to offer competitive towing and hauling capabilities. The current engines are not fuel efficient as the equivalents from main rivals and Nissan must work in this context to offer competitive EPA ratings. There is possibility that Nissan would offer turbodiesel engine as it did in the 2014 Nissan Frontier concept model which used 2.8 liter turbodiesel four-cylinder. Improved four-cylinder gasoline engine will again be the base powerplant and stronger more efficient V-6 will be an option. Engines will work in combination with a seven-speed automatic transmission and six-speed manual. There will also be choice between rear- and front wheel drive. What is also expected, the model will get revised suspension system which will be backed with improved steering system and brakes which will improve driving quality and will also allow higher loading capacities. There will also be special suspension tuning, underbody protection, standard electronic locking rear differential, all-terrain tires and more for off-road oriented Frontier’s version. 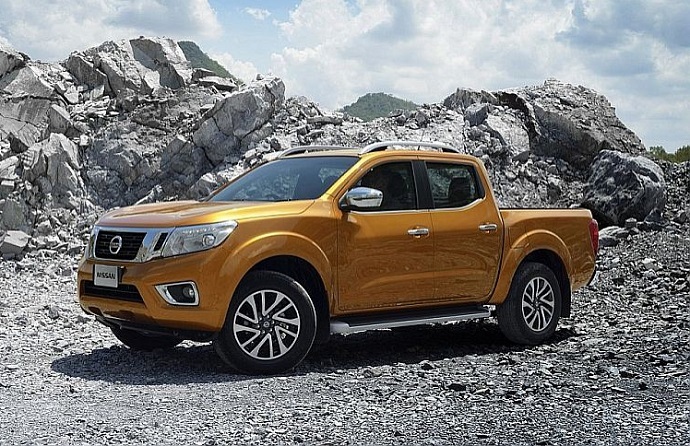 The company will probably continue to deliver the new 2018 Nissan Frontier in the current range of trims which include S, SV, Pro-4X and SL. The current base version is sold for $18, 300 but the new model will surely raise the lower and upper price boundaries. This model should go on sale in second half of the next year.